For many years crimped style hose fittings were a luxury enjoyed by professional racing teams and very few others. The benefits of crimped hose ends have been known for a long time and now most styles of racing use them and see the benefits. Along with weight savings, tamper free collars and modern day fuels the use of crimped hose ends using Teflon inners is almost a must have. Also, in recent years favourable pricing and more ready access to crimping machines has made it really easy to make great hoses. It’s widely known that there are a few companies pushing crimp hose ends but there is one company who truly holds all the playing cards. Brown and Miller Racing or BMRS as it’s better known sell a massive range of crimp style hose ends for all applications. Readily available in their signature Blue/Gold they are also starting to stock the solid black range as well. Motorsport Connections (MSCN) is the recognised Australian dealer for BMRS and as such carry the entire range at the Sydney store. As part of the range we also carry the BMRS crimping machine. 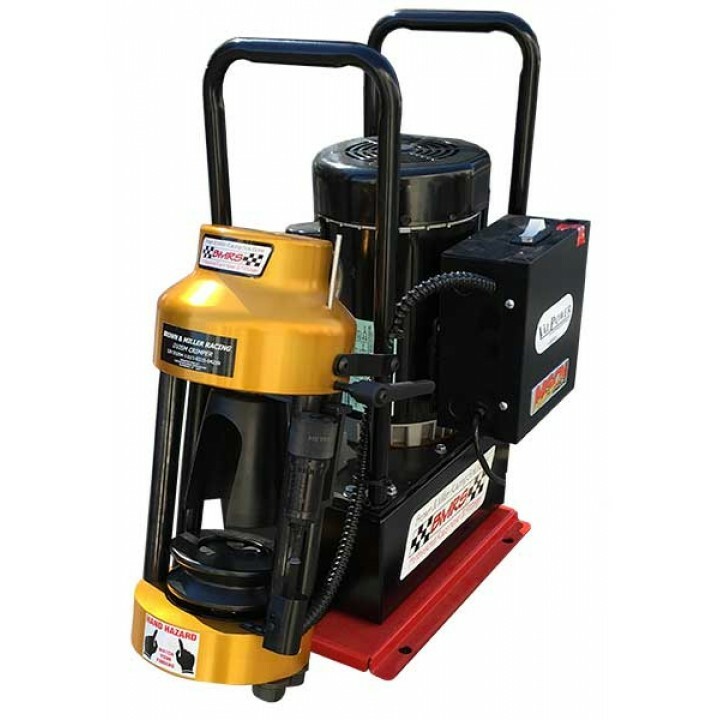 This is by far the best mobile hose crimping machine on the market. The 1HP, 240V pump makes fast crimps anywhere, in your shop, or in your race trailer. It's a compact machine with a small footprint, measuring in at 11 inches wide, 14 inch long base and 19 inches high, this allows the D105 to be placed anywhere on your bench. The fully adjustable direct reading micrometre style crimp adjustment accommodates a wide range of hose and fittings or cables for precise crimp diameters making this a fast and easy crimp whether you’re doing 1 crimp or 100’s of crimps. Includes full die set (-3SB, -4SB, -6, -8, -10, -12, -16) with -02, -06 Smooth bore and -20 available at an extra cost. A pneumatic remote switch is operated by hand or foot with no electrical wires. Please note: Motorsport Connections Sydney have these machines built by the manufacture in America to suit Australian 240V. As such they come complete with all installation and parts required to crimp the above hoses as listed. In stock at all times. Click here to view the BMRS machine working. Make your own professional hoses with a Brown and Miller Hose Crimper. Note: Fittings and Roller Box sold separately.